David had no professional ministry experience and limited education when he felt God drawing him into pastoral work. In fact, two colleges (including Anderson) refused to admit him because his high-school grades had been so poor. Yet he pressed on. He earned not only an undergraduate degree, but also a doctorate. After serving congregations in Indiana, Arizona, and Ohio, he was chosen as dean of the School of Theology in 1995. 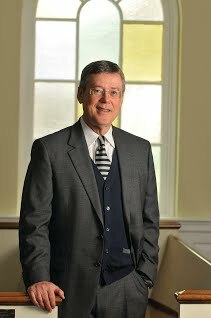 Sebastian retired in 2014 after the longest tenure as seminary dean. “Along the way, I have learned that regardless of our age or stage in life, we must never give up following God,” he writes. 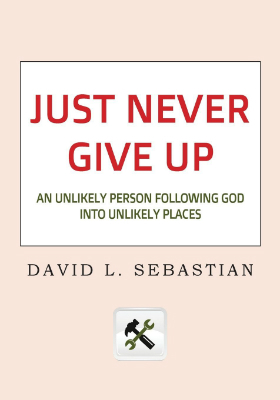 Just Never Give Up candidly reports that, at times, he felt overwhelmed by the responsibilities of ministry and frustrated by relationships conflicts. As a newcomer to academia, he found that some faculty members held him at arm’s length. Yet he learned to overcome this, as well, and led the institution into a period of healthy growth. An epilogue reflects on changes Dr. Sebastian has seen in the church over the past forty years. He recently served as interim pastor for Church at the Crossing in Indianapolis, where he was an associate minister as a student. He notes several contrasts between the church then and now, which reflect trends he has seen in other congregations across America. Just Never Give Up is available in paperback and hardcover at most bookstores and online book retailers. This entry was posted in All Church of God, Colleges & Universities and tagged AU, AU SOT, author, autobiography, bio, biography, book, Church at the Crossing, David Sebastian, dean, education, higher education, Jim Lyon, Just Never Give Up, memoir, School of Theology, School of Theology and Christian Ministry, SOT, writer. Bookmark the permalink.